I can open my own school now with all that I've learned in my first 12 days in Paris. The subject matter would be a wide range of topics ranging from dialing a phone to grocery shopping. Seemingly easy topics? Mais non. For example, dialing a cell phone is different than dialing a land line. There's different prefixes and symbols involved - yes, symbols. 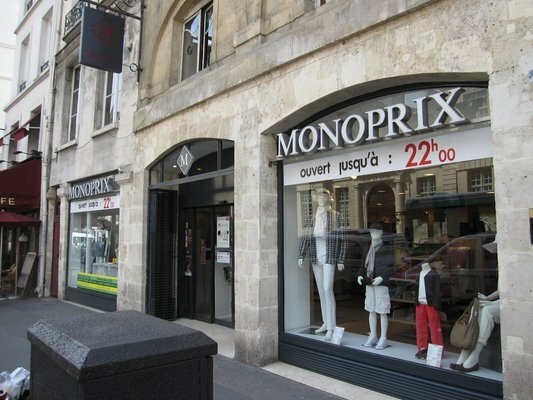 And see those convenient grocery carts in the "monoprix?" Yeah, try and grab one and it's locked to the one in front, and you don't have a key. 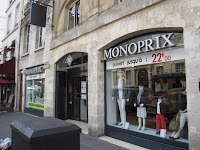 There are tokens that they actually give you for free, which may potentially beg the question why lock them at all when they're in a basement, but I digress, though not before giving a big shout out to my local monoprix, which is a hybrid, CVS drug store, Macy's, Barnes & Noble, Sephora, and Ralph's grocery store, all in a compact 2 story space that's easily navigatable, minus the cart. I learn about 27 new things a day, but this week I need to up that number to about 106 as I've started French class. Walking into my first class was like walking into a coffee break for the UN. There were faces from all over the world - Japan, Angola, India, Serbia, Philippines, Russia, which means that the only common language in the classroom is French, and we're all still in the earlier phases of learning the language. I did take a placement test so I wouldn't have to start at "Bonjour," but that also means that the teacher speaks nothing but French, which might make sense to some, but when she asks or explains a definition of a word, she does this with more French. It takes some getting used to, but it's good to practice and be forced to speak. I'm taking class 3 hours a day, 3 times a week, which is putting a bit of a cramp in my schedule, but I figured speaking to the natives to figure out things like how to get a shopping cart should be a pretty high priority. One of this past week's key learning's has led me to be a proud owner of a set of wheels. Well, more of a co-owner/renter of wheels. And actually there's just two wheels involved. I have signed up for the velib bike system in Paris, which of course was a multi-step process involving visiting Town Hall to get a special card, going through security, filling out online forms and then going to a machine with all items to activate the card. All of this has enabled me to use Paris' wonderful network of bikes. They have bikes parked at 1800 stations all over the city and you just wave your card over a post to release a bike, and then you're on your way. You can drop the bike to any station you want. You pay a set up fee, and then the first 45 minutes is free and with stations everywhere, you just drop it and then can get another one. My walk to school was about 45 minutes, and my bike ride is 20 minutes, so I can now see twice as many things in my day. So many Parisians ride the bikes - men in suits, women in dresses, and the best part is that there's a basket attached to all of them, so it's my trunk for hauling heavier things home. C'est superbe!